You’ve heard it said a million times over: “Breakfast like a king, lunch like a prince, and dine like a pauper,” and yet many find excuses for not eating breakfast, citing too little time during busy mornings of preparing for work and getting kids ready for school, trying to lose weight by cutting calories, or that they’re just not hungry when they wake up. Whatever your excuse, it’s high time to get on the breakfast-eating bandwagon. There are some serious benefits to eating a healthy, well-rounded breakfast that will last throughout the day, boosting your performance at work, while you do errands, or at school. Here are just a few of the things that research has found a healthy and hearty breakfast can do for you and some reasons why you might want to consider using a breakfast catering service in the near future. It Keeps You From Binging - Eating a healthy breakfast containing protein and/or whole grains can help you to feel fuller for longer throughout the day, which prevents people from reaching for a high-fat and calorie-dense slice or two of pizza or going to McDonald’s at lunch. People who eat a balanced breakfast make healthier choices at meals and skip candy or chips for afternoon pick-me-ups. It Jumpstarts Your Metabolism - Many of your body’s systems automatically slow down when we’re asleep, as they focus on restoring energy after a long day. Breakfast is an essential way for your body to continue to recharge and prepare itself for the coming day. It wakes up your digestive system, in particular, and starts your metabolism. When you don’t eat breakfast, your metabolism slows down, thinking that it needs to conserve energy, and burns fewer calories the rest of the day. It Provides Energy - When your body doesn’t get the nutrients it needs, you may feel sluggish and lethargic throughout the day, dragging your feet through the many tasks and activities that you have to carry out. A healthy, filling breakfast will give your body the energy it needs to boost your performance at work and school, helping you to concentrate and improving cognition and short-term memory. It Improves Your Mood - A good mood helps you to not just get through, but enjoy your day. It transforms tedious tasks into enjoyable diversions and challenges into opportunities to shine. A nutrient-rich, low-fat breakfast will help to regulate your blood sugar levels until lunchtime, stabilizing your mood and preventing mid-morning crashes. A burst of energy and productivity in the morning will set the stage for a good day at work, lessening the stress of an afternoon panic to make up for lazy morning hours. How Can Our Breakfast Catering Benefit Your Company or Event? Pulled by the demands of professional life and personal life in the morning, many busy Toronto workers may not have time for much more than a gulp of coffee and a piece of toast in, a paltry excuse for a breakfast that lacks nutrition and energy. Some companies counteract this and seek to improve their employees’ health by arranging bagel Fridays or breakfast catering during early morning meetings. Investing in breakfast is investing in your workers’ all-day performance, boosting productivity and encouraging creativity. Breakfast catering is also ideal for mid-morning or early afternoon weekend get-togethers such as showers or networking events. With healthy options like protein-rich bagels and lox, low-fat yogurt parfaits, and fresh seasonal fruits platters, our brunch event catering is delicious, filling, and guilt-free. Pumpernickel’s rise-and-shine event and business catering is dedicated to helping you start off the day right, no matter which side of the bed you get out on. 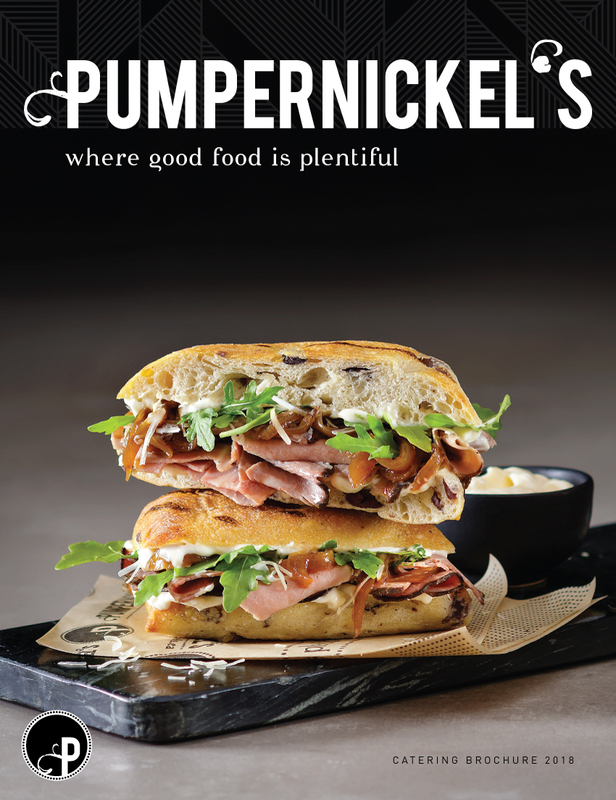 Since 1986 Pumpernickel's is a leader in corporate catering. It has been one the premier deli and caterers in Toronto, with thousands of satisfied customers in the GTA. Many of our kitchen locations are located within Toronto's financial core to provide timely services for catering in downtown Toronto. We use only the freshest ingredients, and promise excellent customer service and value for all of your catering services. As soon as you become our regular customer we will not let you down. We are one of the leading corporate catering companies in Toronto, which also offers breakfast catering and sandwich catering. Visit us on Google+.